It didn't take but a minute to decide to bookmark your site for easy access. Attached is another pic, in case one works better for you than the other. 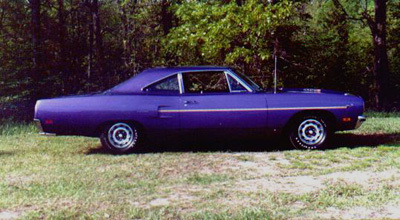 Our '70 Road Runner is 1 of 429 made (a coupe), it is a #'s matching 440+6 and a consistent winner at local car shows. It has a 4spd pistol grip, Dana 60 w/4:10 gears, never been restored. The interior is in unbelievable condition. It turns heads every where we go. It is driven every where we go, no trailer for this queen. Some of the options on this car are: tic-toc-tach, am radio, GoodYear F70X14 polyglass tires, pinion snubber. She is plum crazy outside with black interior. No air grabber hood. Is that unusual? No matter, it is fun to drive and we do every chance we get. Thanks again for featuring our car!